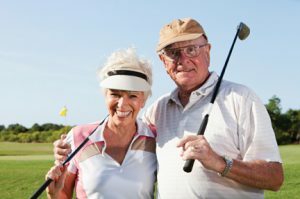 Senior couple, 70s, on the golf course. Professional golf instructors estimate that 80-100% of golfers’ swing problems begin from faulty posture. Therefore, having a Chiropractor evaluate your posture should be the first and most important step toward building an optimal golf swing. Most postural faults are caused by muscle and connective tissue imbalances that pull a golfer’s body out of alignment, or a misalignment in spinal bones. The result of an unbalanced or asymmetrical standing posture will always be unbalanced and decreased performance. If the golf instructors are correct, a poor posture, when addressing the ball, will result in a poor and/or inconsistent golf swing. Moreover, sooner or later, golfing with a poor posture and swing motion will cause injuries. Research states that 80% of the population has lower back pain. An onlooker may assume that the never-ending quest to put the little white ball into the cup calls upon little of the athleticism required by other warm-weather sports such as tennis or cycling. Not true. Many avid golfers contort their bodies into oddly twisted postures, generating a great deal of torque-the twisting force that opens a bottle cap-on the back. Couple this motion with a bent-over stance, repeat 90 to 120 times over three or four hours, add the fatigue that comes with several miles of walking, and you’ve got a good workout-and a recipe for potential lower back trouble. As America’s love affair with the game continues to grow and are playing in a big tournament, chiropractors advocate taking a proactive approach that will prepare your body for many years of pain-free play. “Most golfers go until they are in pain, then look for immediate relief. “Cagen Family Chiropractic advocates a different approach-by helping patients look at what they can do right now to reduce the likelihood of future injury.” We want people to be able to play without pain and have the greatest potential for a lifetime.